Ebony Maw could be much more than you'd expect. Thanos might be the main villain in Avengers: Infinity War, but he brings with him a crew of intergalactic, superpowered henchmen in his hunt for the Infinity Stones. At least one of his generals, Ebony Maw, will probably be so much more than just another lackey. He might even have his own secret motives. Inverse recently spoke with actor Tom Vaughan-Lawlor, who plays Ebony Maw in Infinity War, about playing complex villains not only in the MCU but in other movies like the zombie-filled The Cured. In The Cured, that means playing a politically volatile man in Dublin who is totally furious with how people mistreat former zombies trying to rejoin society. 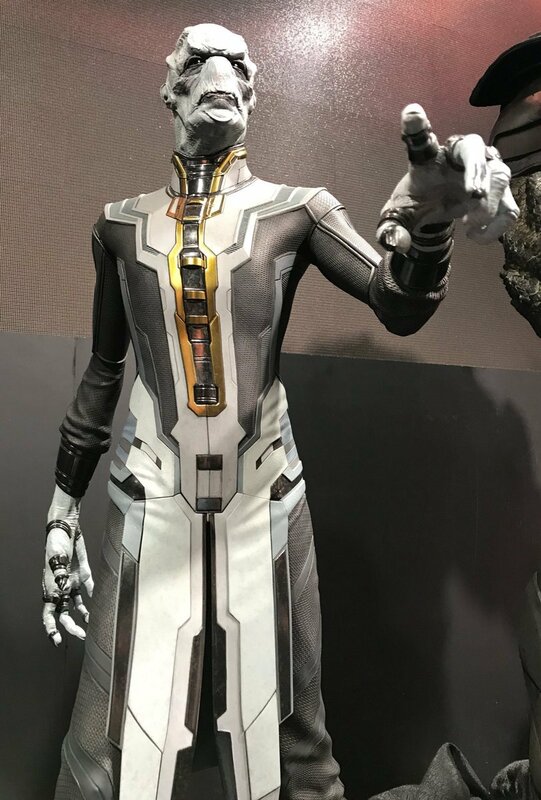 But for Infinity War’s Ebony Maw, Vaughan-Lawlor probably had to bring a whole different kind of darkness to the role. Tom Vaughan-Lawlor in 'The Cured'. Infinity War set photos that leaked in July 2017 showed an actor in a mocap suit wrestling with Doctor Strange. Everyone assumed the “EB Maw” written on the suit stood for “Ebony Maw,” one of Thanos’s henchmen. By August, Marvel Studios confirmed that it was indeed Ebony Maw, and Tom Vaughan-Lawlor was the man playing him. Even now, firm details about Maw’s role in Infinity War are scarce — and Vaughan-Lawlor isn’t budging one bit — but he does hint at more complexity to the character than you might expect. When talking about his work on Infinity War, Vaughan-Lawlor spoke highly of directors Joe and Anthony Russo, saying, “They were all about the truth of this character and what his objective was and what he wants within that universe. Although you’re playing at the operatic supervillain level, what they were asking of me as an actor was to find the truth of the character in the scenes.” We can’t possibly interpret what that “truth” is, but we can make a few guesses based on what Ebony Maw did in the comics. Ebony Maw manipulates Doctor Strange in the comics. Ebony Maw is a child of Thanos and member of the Black Order — that much we do know about how he fits into Infinity War. In the comics, he’s considered the most dangerous one of them all. He’s a psychological mastermind, genius manipulator, and he can even infect people’s minds enough to gain control over them. If that makes him seem like the archetypal lieutenant with ambitions greater than his loyalty, then you’re right. In the comics, Ebony Maw betrays Thanos, turning the Mad Titan’s son, Thane, against him. In the end, the Avengers sort of have Ebony Maw to thank for their victory over Thanos. So if the Russos wanted Vaughan-Lawlor to bring Ebony Maw’s own objectives into each scene, how might that impact Thanos’s hunt for the Stones? Does that mean that Ebony Maw’s objectives in Infinity War don’t align with what Thanos wants to achieve? Chances are the already over-stuffed Infinity War won’t feature a full-fledged storyline where Ebony Maw betrays the big bad the MCU has been working up to for years, but it wouldn’t be too surprising if we got a sense that Ebony Maw is a malcontent with unacted upon motives of his own. We’ll have to wait and see.